Dandelions, the scourge of any homeowner who’s goal in life is to have the nicest lawn in the neighborhood. Their “yellow heads” are just not acceptable! They got to go. Control of dandelions is not difficult. If you only have a few take a knife and cut them out of the grass. You must cut them off approximately two inches under the soil. They have a tap root and another plant will grow back if you superficially cut it off at the grass level. Chemically, there are a few good products on the market, which can be purchased at any garden center. Just remember, if you get rid of the dandelions, what will your grand children pick for Mother’s Day? Another interesting fact is dandelion greens are in the top five for overall nutritional value when used as a vegetable in a salad. There are also numerous medicinal qualities to the dandelion. Dandelion greens are extremely high in vitamin A.
Centipedes in your garden, do they pose a health threat to you? First, in the entire world there is only one known death from the bite of a centipede. So relax when you see one. Don’t panic. You can out run them if you have too! In general, if bitten by a centipede it will be similar to being stung by a bee or wasp. Painful for a short period of time and the stinging sensation gradually diminishes in just a few hours or in the most extreme case it may take 2-3 days. Usually there is no need to go to the doctor if bitten, however if you are allergic to bee stings you it may be a good idea to check with a doctor. 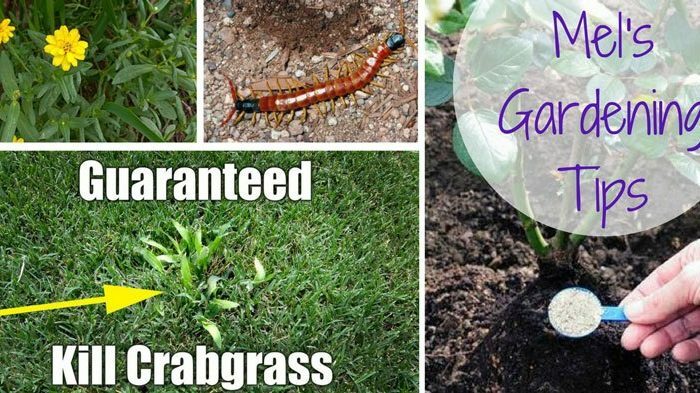 Beneficial factors in favor of the centipedes in your garden are: they eat insects, spiders and in case of the largest members of this group they will eat geckos, small frogs/toads, small lizards and the occasional mouse. How can you tell a centipede from a millipede? There are three simple ways to distinguish a centipede from a millipede: (1) When touched, a millipede will roll up its body, (2) centipedes have two legs per body segment and millipedes have four legs per body segment, and (3) centipedes have a flat body and millipedes have a round body. When at the store do not just pick the first rose bush you see and take it home. Spend a few seconds inspecting it. Use the following check list as a guide to buying roses. 1. The stems should be green all the way to the tip. There should not be any discoloration or scars on the stems. 2. Roots should be healthy, well branched and very numerous. 3. Buds on the lower portions of the stems should be swollen and plump. Any damage to these buds, or the lack of any buds, indicates a plant that will not produce many new stems the first year. 4. Check the main stalk just above the roots. There should not be any scars or any kind of damage in this area. Also look for spilt bark, any openings will make it easy for disease organisms and insects to attack. 5. The number of desired, healthy canes on the plants you are buying depends on which kind of rose you are buying. Floribunda roses should have at least two canes(15 inches long), climbing roses a minimum of two canes (24 inches long) and a hybrid tea rose should have three sturdy, health canes (18 inches long). I have noticed crabgrass growing in my lawn this fall. Should I try to kill it now or wait until next year? The best time to control crabgrass is in the spring. Use a pre-emergent chemical when the seeds are just starting to germinate. Once the plant has matured just wait until spring to get our revenge. Trying to kill it in the fall is not necessary if you live where temperatures drop below freezing. The first frost will kill this annual for you. Chemicals used to eliminate broadleaf weeds (dandelions, spurge, oxalis, knotweed) will not kill or even slow down the hardy crabgrass! When comparing roses to African violets they are just the opposite when it comes to selecting a fertilizer to achieve maximum flowering. Mature African violets should be giving low nitrogen in a feeding program to promote flowering. For roses to produce numerous flowers per plant they require high nitrogen applications. Apply one cup of a complete fertilizer, which is high in nitrogen, four times during the growing season. Rose plants have a fairly shallow root system so when you mix the fertilizer into the soil do not dig to deep. A complete fertilizer is one containing nitrogen, phosphorus and potassium. An example would be 16-16-16. Considerable news coverage has been given to pesticides and how they damage the delicate balance of nature. Seldom do you hear about the millions of human lives saved throughout the world because pesticides were used to combat the insects which transmit some of world’s most deadly diseases. Many areas of the world have seen diseases reduced and even totally eliminated when pesticides were used. Conservative estimates by the world health officials place the number of lives saved in various parts of the world at five million by controlling diseases, such as: malaria, typhus, yellow fever, and sleeping sickness. Presently (2007), malaria strikes 300 hundred million people every year. In one tiny Southeast Asian nation, Sri Lanka, 540,000 people contracted malaria in a single year. In 2007 malaria will kill one African child every 30 seconds. Do the math and that’s 1,051,200 every year! At one African health clinic 300 children with malaria arrive everyday. Doing the math again, that’s 109,500 per year at just one of hundreds of clinics throughout Africa! Another estimate has stated approximately sixty to eighty million human lives have been saved in the last fifty years by the use of DDT to control the insects which transmit malaria. One of the famous arguments against the use of pesticides is how they accumulate in the food chain, eventually becoming concentrated enough in the lower orders of animals (worms, insects, mice), causing some of the larger predator animals in the wild to suffer and even die. While I can feel sorry for the occasional bird or coyote which dies from pesticide poisoning, somehow my sympathy leans towards the sixty to eighty million humans on this earth who owe their lives to the fact a pesticide was used which helped to control some of the serious insect-borne disease, giving them a change to enjoy life on earth. When is the best time of day to water a lawn? The best time is early in the morning when the wind is calm and the grass is already wet with dew. Usually the water pressure will be higher in the morning. Remember that keeping the grass wet for long periods of time during hot weather incubates diseases. While morning watering is the best time slot for seeing to your lawn’s needs, you should be aware watering can be done anytime. In some cities and states, laws dictate the time of day and the day of the week you can water your lawn. Nutrient requirements vary for different plants. African violets, roses, and lawn grasses will be used to demonstrate the different nutrient requirements of plants. African violets, as young developing plantlets need nitrogen to promote rapid growth and maturity. Once they have reached maturity these plants only require small amounts of nitrogen to sustain adequate growth and to promote flowering. Excess nitrogen inhibits flowering of mature African violets. Roses prefer a high quantities of nitrogen to promote the abundance of blossoms the grower is seeking. As cool weather approaches the level of nitrogen in the soil should be at its lowest. Lawn grasses are similar to roses in that higher amounts of nitrogen promote a dark green lawn and one in which damage areas heal more quickly. With grasses it depends on what type you have in your lawn. Bermuda grasses require approximately 1.0 lb. of actual nitrogen per 1,000 square feet/month during the growing season. Kentucky bluegrasses require between 4 to 8 lbs. of actual nitrogen /1,000 square feet/year. The exact rate of application will be determined by the climatic conditions of your area. Having a basic understanding of the plants you are growing and their nutrient requirements will greatly influence your ability to achieve your goals of becoming the “Green Thumb” expert in your neighborhood. Your out in the garden enjoying a beautiful sunset. Suddenly, you notice several of the leaves on various plants have turned yellow, with the green stripes running through them. These stripes are actually outlining the veins (piping or distribution system) in the leaves. You wonder, what is the problem and how to fix it? When the leaves are yellow and the green veins in the leaves stand out, the plant is boldly announcing the need for a special fertilizer, one which contains all of the micronutrients (plant food). The micronutrients are: iron, manganese, copper, zinc, chlorine, and molybdenum. Of these the iron and manganese are the ones which will return the leaves of the plants to a healthier dark green color. This assumes you are also feeding the plants adequate nitrogen which keeps the entire leaf green. The reason the green veins are prominent when iron and manganese have limited availability to the plants is they are not very soluble in water. This means as the availability becomes limited these nutrients become concentrated in and close to the veins. The insolubility prevents them from moving out into the rest of the leaves, thus causing the leaves to turn yellow and the veins to remain green. When you are selecting flowering plants for your outdoor garden consideration as to whether they are annuals, biennials, or perennials is important. You should also know the time of year the plants will flower. This topic will be discussed in Tips # 11, 12 & 13. Understanding the life span of your flowering plants influences your gardening budget. If living in a colder climate, where extremely low temperatures and snow occur then choose winter hardy perennials and plants which produce flowers early in the spring from bulbs (crocus, tulips, hyacinths). As weather warms up visit the local garden centers and purchase bedding plants for instant flower color in your garden. A few of these plants are perennials but because of the colder winter temperatures that kills these plants, they are grown as annuals. Annual: A plant whose entire life cycle is completed in a single year. These plants grow from seed, mature, flower, produce seed for the next years planting, and then die. Partial list of annual flowering garden plants: ageratum, alyssum, begonia, impatiens, marigolds, petunia, salvia, snapdragons, and zinnia. Biennial: These plants require two years to complete their life cycle. During the first year vegetative growth occurs, building up food reserves for the next year. In the second year the stored food is used to produced an abundance of flowers. Plants die at the end of the second year after seed has formed and cold weather arrives. The best known biennial flowering bedding plant is the pansy. Perennial: Plants which live year after year and produce flowers each season, often living for ten or more years and should be the mainstay of any flower garden. Partial list of perennial plants: bleeding hearts, chrysanthemums, columbine, coral bells, delphinium daylily, four-o’clocks, iris, peony, phlox, Shasta daisy, and sedum. It should be noted the woody perennials are not included in this list nor or flowering plants produced from bulbs (see Tip # 11). Carefully select bulbs that spread the bloom period from very early spring to the end of spring and the beginning of summer. There are many new hybrids of the above mentioned plants which produce blooms at varying intervals during the spring months. Your bulbs require a minimum soil temperature of 50 degrees F. or lower for at least 12 to 14 weeks. This hardening-off process sets the stage for the bulbs to sprout and producing showy blossoms to herald in springtime. If you live where the soil temperatures are to warm it is possible to place them in a refrigerator or cool basement. Remember the above temperature and length of time requirements for the hardening-off process to be completed. Early spring color using bulbs was discussed in Tip # 11. If you elect to grow annual flowers from seed then it is important to understand these plants bloom at different times during the summer. Examples of spring blooming annuals: sweet alyssum, snapdragons bachelor button, larkspur, baby’s breath, and forget-me-nots. Examples of summer blooming annuals: china aster, feather cockscomb, cosmos, petunia, gloriosa daisy, marigold, verbena, and zinnia. Most of the annuals in each group are sold every spring at local nurseries as bedding plants, in full bloom in two to four inch pots. Examples of perennial plants, color of flowers and bloom period: yarrow, spring, yellow & white; columbine, many colors, spring; aster, blue, fall; Shasta daisy, white, spring & summer; chrysanthemum, many colors, fall; delphinium, white, blue, purple, spring; peony, red, white, pink, spring; phlox, white pink, lilac; spring & summer; and violets (not pansies), violet, spring. Woody (shrubs) perennial flowering plants have not been included in this discussion. AfricanVioletBooks.com is a participant in the Amazon Services LLC Associates Program, an affiliate advertising program designed to provide a means for sites to earn advertising fees by advertising and linking to Amazon.com. Additionally, ThankYourSkin.com participates in various other affiliate programs, and we sometimes get a commission through purchases made through our links.